As he walks the halls of the University of New Brunswick’s Saint John campus, business professor Emin Civi is rarely without a smile, a cheerful hello or a word of encouragement to students. His enthusiasm and passion for his job shines. “Emin Civi is much admired and respected by his faculty colleagues, staff and students alike and his presence here at UNB Saint John is an enormous asset to the faculty of business, the university and the community,” says Fazley Siddiq, dean of business on the Saint John campus. “He infuses the daily work of the faculty with energy, vigour and rigour through his cheerfulness, industry, intellectual curiosity and constant efforts to advance the faculty and enhance the quality of the education students receive here,” Dr. Siddiq says. For his commitment, Dr. Civi has earned a string of teaching awards both here and in the United States in recent years. The University of New Brunswick is honouring him with a Neil Scott Educational Leadership Award. “The Neil Scott Educational Leadership Award recognizes individuals who encourage excellence in teaching, and Emin is certainly an exceptional choice. Not only is he a phenomenal teacher in his own right, but his deep commitment to bettering the profession and practice of teaching is inspirational,” says Robert MacKinnon, vice-president of UNB’s Saint John campus. 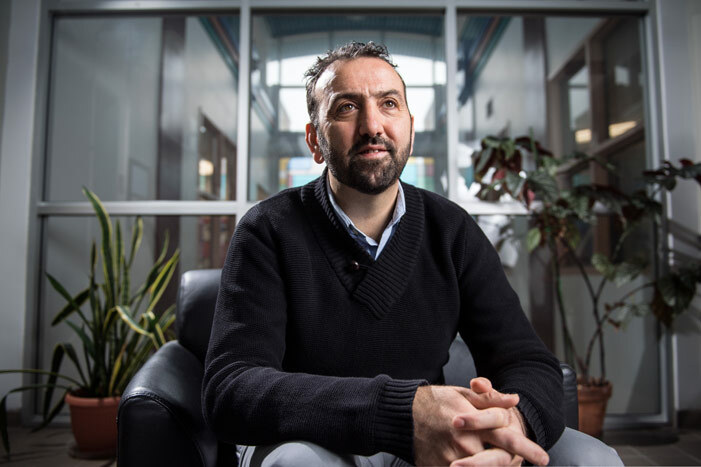 Dr. Civi, a native of Turkey, was teaching at Michigan State University for a year as a visiting scholar when he seized on the opportunity to join the University of New Brunswick, and in 2005 arrived in Saint John. He’s never looked back, attracted by what he describes as a “kind and supportive” environment at UNB. Among other achievements, he has founded a number of programs within the business faculty to propel teaching excellence, launched a marketing major on campus and created mentorship opportunities for professors. The 2017 Neil Scott Educational Leadership Award is the latest of many teaching accolades, including the Hormel Meritorious Teaching Award from the Marketing Management Association in the United States in 2016, the Association of Atlantic Universities Distinguished Teaching Award in 2015, the UNB Teaching Scholar Award from 2012 to 2015, and UNB’s Allan P. Stuart Award for Excellence in Teaching in 2011. He is humble in the face of the recognition. He says he is inspired by the belief that better teaching not only helps students but makes a positive impact on society. Photo: Emin Civi, a professor of business at the University of New Brunswick’s Saint John campus, is being honoured by the university with a Neil Scott Educational Leadership Award. Credit: Rob Blanchard / Photo UNB.